I almost didn’t get to yoga today. No good reason, I just wanted to sit around this morning instead of sweating and stretching. But at the last minute I drove over to Bikram Yoga St Louis for the 9:30 class where I started by talking with the teacher Katherine about my road trip and the various studios in which I’ve practiced. She was highly interested in my trip and it turns out she’s a relatively new teacher. She ran a great class and was excited to have me there. The studio isn’t my favorite – perhaps the carpet needs to be replaced after all the years of sweating into it?? – but I liked Katherine’s energy and style. She’s the kind of teacher I like because she’s strict and focused but accessible. But then all this self consciousness led me to my yoga thought of the day: I need to let go of my vanity. At the end of class, Katherine said “Remember why you are here and then come back.” I’m in Bikram classes to improve both my life and my yoga practice. I’m not here to admire my poses in the mirror or to hope that someone saw me do something spectacular. That’s a waste of my time. Even if I focus solely on my practice for 100 years, I will still have room for improvement. These poses are hard. People devote their lives to yoga perfection. When I come to the yoga mat and wonder what someone else thinks of my practice, I’m allowing my ego and vanity to run my practice. My ego and my vanity are bottomless pits of need. Neither will ever be satisfied and both will keep me from improvement since they are concerned with superficial constructs. The important stuff happens deep in me and it only comes out when I focus on the practice and I let go of my ego. One of the reasons I like Bikram is the sameness of the classes. When I come to class and do the same 26 poses and it’s different every day, I know the difference is me. 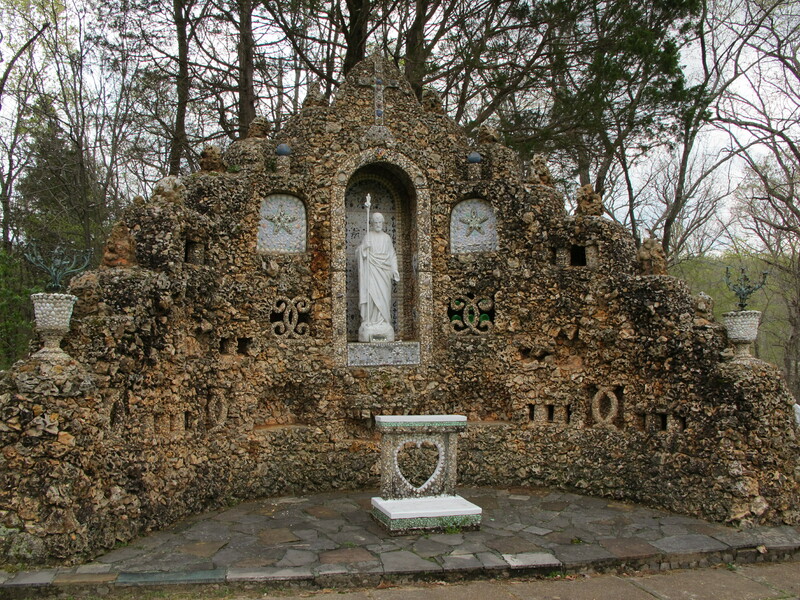 In 1937, Brother Bronislaus began to build this shrine to Our Lady of Czestochowa, called the Black Madonna because of her dark skin. Sister Francis, a lovely lady who showed me around the shrine, said that Mary herself posed for the original painting of the Black Madonna, which was painted by the Apostle Luke on the surface of a table in the house she shared with Jesus. After a long active history of passing from one hand to another over the succeeding centuries, the original painting now lives in the private chapel of the Pope. The Polish people venerate her and Brother Bronislaus grew up watching pilgrims pass through his village on the way to her shrine. 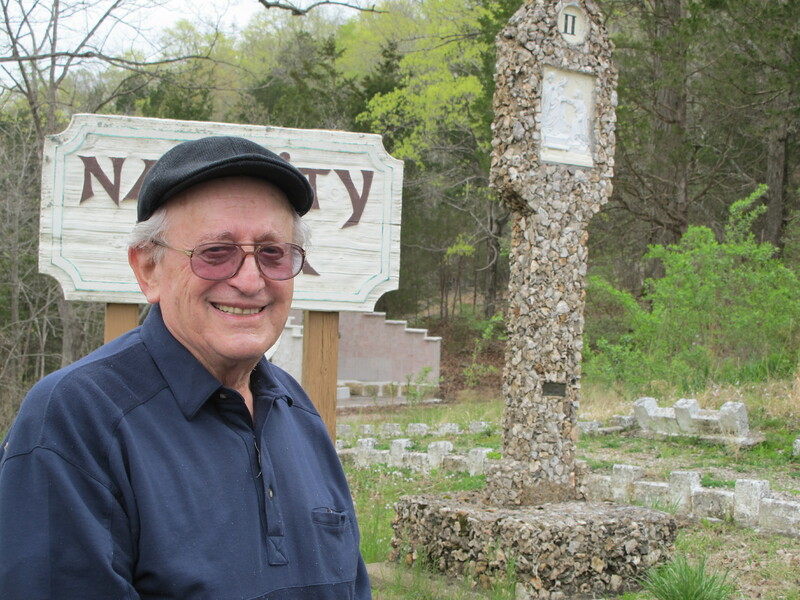 When he immigrated to America in the early 20th century, he joined the Franciscan order and began to build a shrine for her here in Missouri. And then 30 years later, while working on one of the shrines after he had recovered from the flu, he suffered heat stroke, dragged himself to the foot Mary’s statue and his brothers found him there, dead. Can you believe that story?? 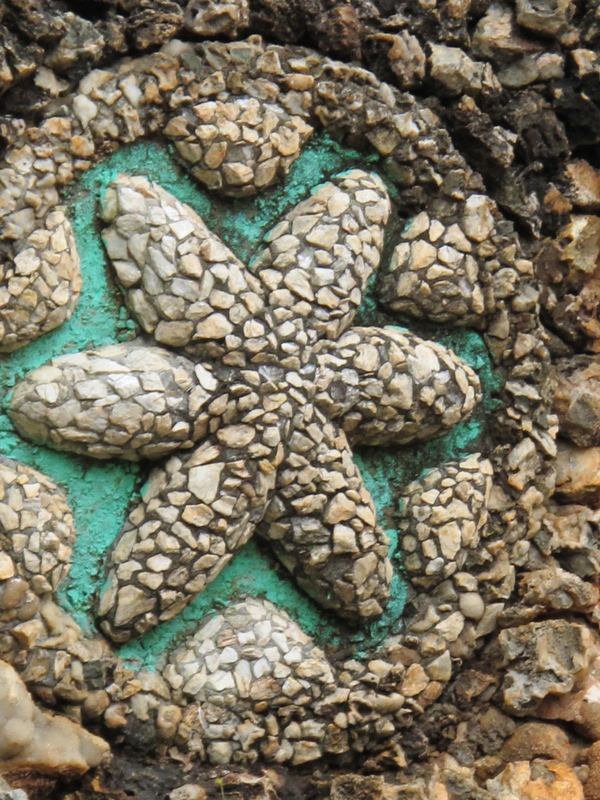 I walked around the shrine and it looked like the work of 50 men with advanced tools! The precision of his designs, the way he decorated even the smallest surfaces, the care he took in the architecture, even pulling pieces down and starting over when they didn’t suit him. It’s awe inspiring to see that kind of persistence and discipline. I had so many questions about his character. Was he obsessive? Was he well liked? Did his fellow brothers think he was inspired or insane? Brother Bernardo is an Italian from New York City who served in WWII. He doesn’t look that old, does he? He joined the Franciscan Brotherhood after his discharge and saw a little ad in the Jesuit Monthly asking for monks to come to Missouri. He shook his head when he told me about this and said “I don’t know why I was called out here. And I can’t believe I’ve been here for 65 years! But you know what? I’ve never had an unhappy day here.” Who of us can say that?? 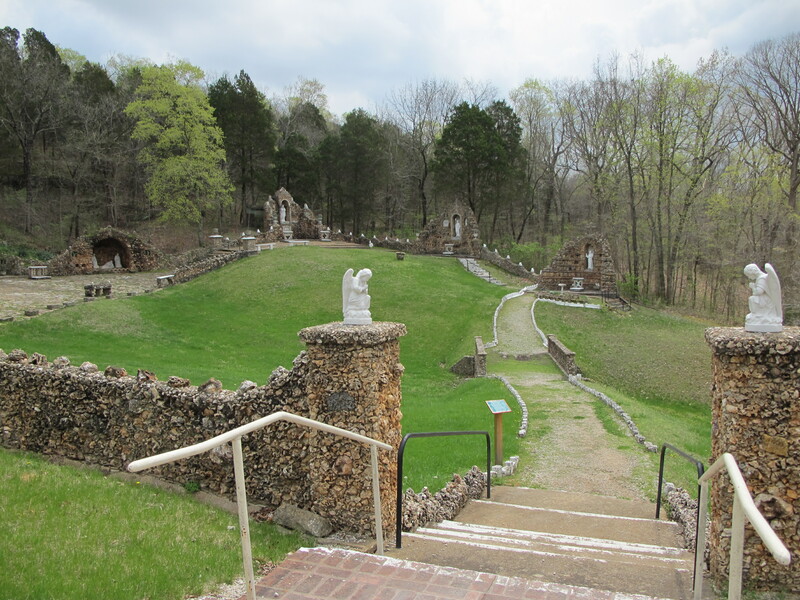 Bernardo joined this monastery at the height of Brother Bronislaus’ building spree and said the Master of Novices would pile all the young monks in a truck and send them out to get stone for Bronilaus to use for the shrine. Bernardo says “He’d take us out in the middle of the field and say ‘dig!’ and I would say ‘dig for what? It’s all grass!’ and the master would smile and say ‘there’s stone underneath. 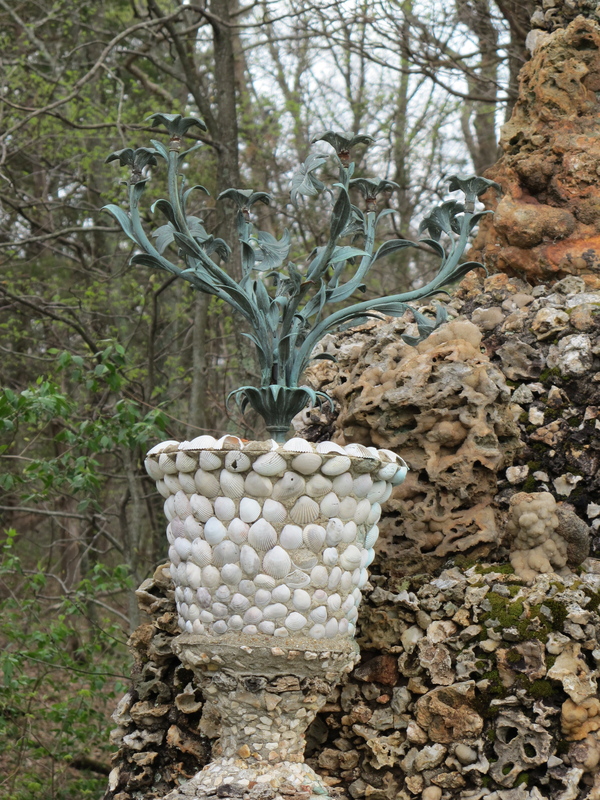 Find it.’” The novices filled up giant barrels of stone and lugged them down to the grotto where Brother Bronislaus and his helper – a freakishly strong but mildly retarded man – were mixing concrete, making forms and building this shrine. I asked about Bronislaus’ character and Bernardo just smiled and said “He was a most humble man. 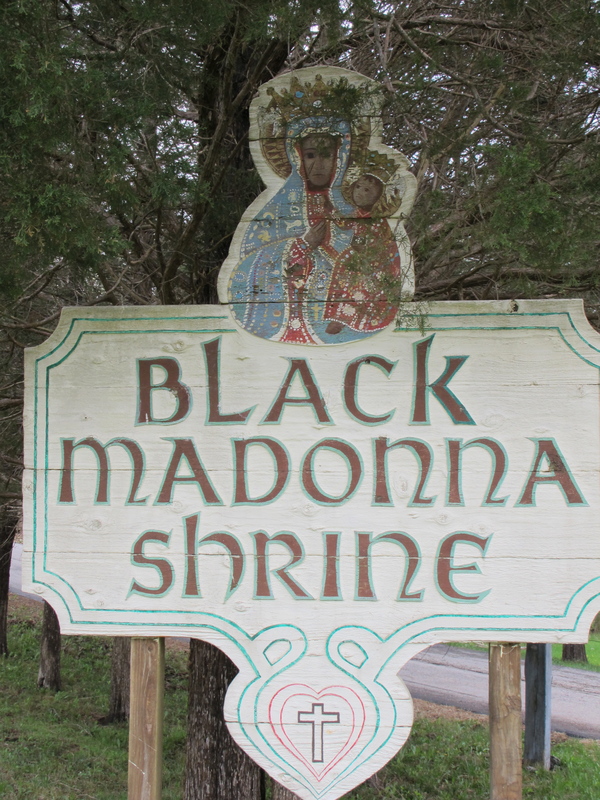 Very devoted to the Black Madonna.” Apparently Bronislaus was so well loved that when he died, the monastery put everyone to finishing the shrine he hadn’t completed and rebuilding the chapel after arsonists burnt it to the ground. They’ve put a lot of time and energy into maintaining the site and keeping alive his memory and his devotion. It’s all very touching and artistically inspiring. I’m amazed at what one person can complete in 30 years when they put their mind to it. Eventually, Bernardo had to go put his robes on and go to a funeral but as he left he put his hand out and said “God bless you, honey. Pray for us. We need it.” I said “I will. Pray for me!” And he nodded and left. When I walked into the gift shop, Sister Francis said “I saw you talking to Brother Bernardo and wondered what it was about and then I saw the plates on your car. He loves talking to anyone from New York!” We talked about my trip and Chicago and I told her I’d seen Our Lady of the Salt Stain. She was instantly intrigued and said she hadn’t heard about it. I told her I had pictures so I went to get my camera, a little curious about a nun’s reaction to this phenomenon. I found the pictures and showed her the first one, prepared to say “You can see her face here… it’s not the greatest picture but you can kind of see what they are looking at… maybe if you turn it like this… I think I have a better shot…” I don’t know what I was thinking. The second she looked at it she just gasped and said “oh my goodness, it’s Mary! Oh, I need to show this to Mike. This is incredible! Can I borrow your camera? ?” And then she dashed away to show the pictures to a monk across the way. And I thought, well, I guess if you work with someone your whole life, you’re bound to recognize them, right? These people have spent their lives looking at representations of Mary so when she shows up in Chicago, they know it’s her. Sister Francis even found a shadow of another visage of Mary in the picture I had and I can actually see what she’s talking about. 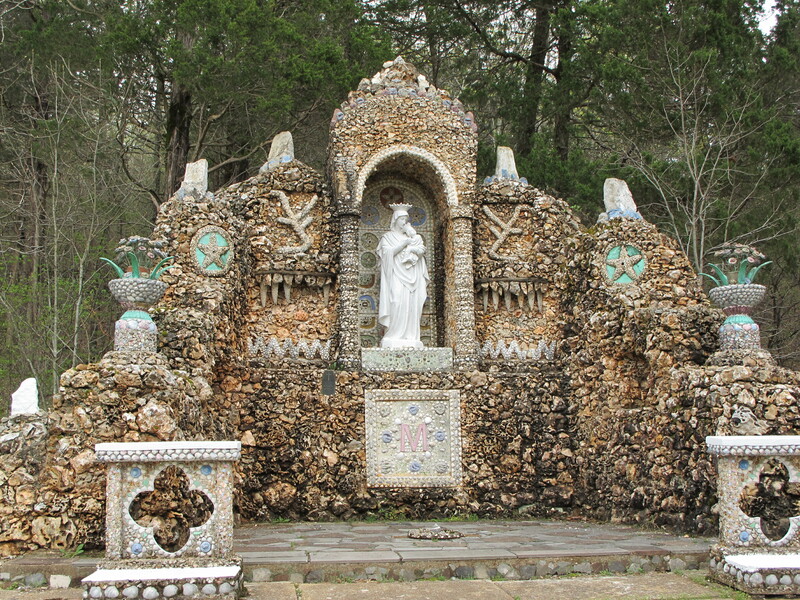 She didn’t seem spiritually overwhelmed, which might have seemed a bit disingenuous, but more pleased that Mary had made an appearance and that people were maintaining her shrine. It felt like she was seeing a picture of someone she really liked and she was happy that other people had seen her too. Curious. Intriguing. I was glad I had the pictures and thought to show them to her. 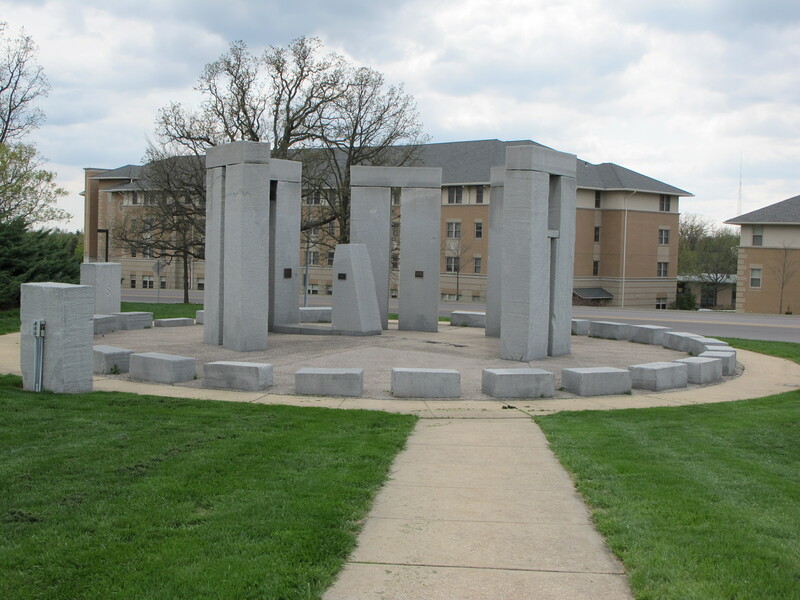 It’s on a Science college campus, so no surprise there, with a bunch of explanatory panels on each pillar and windows through which you can apparently see the north star, Polaris. That would be worth seeing but not if I have to stay in Missouri to do it. 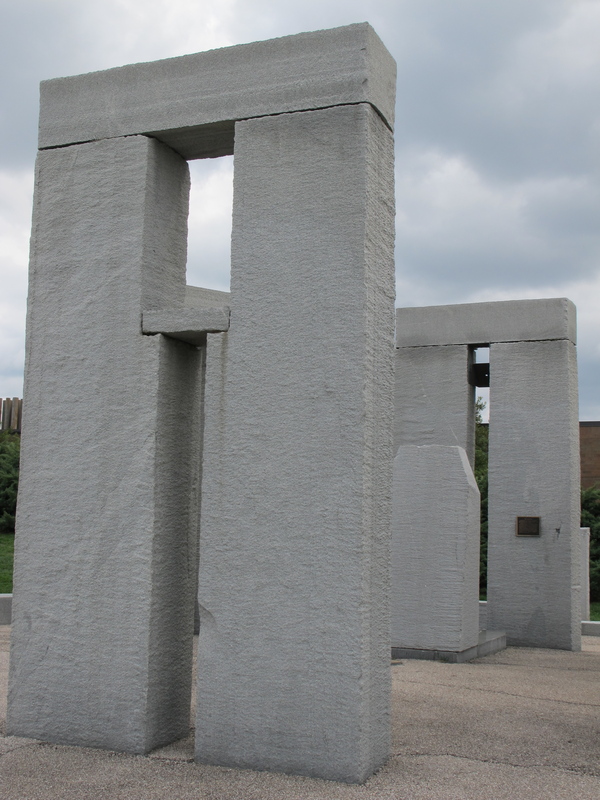 Makes you wonder what the American obsession is with Stonehenge. Maybe it’s a lack of our own ancient culture, given that so few of us are Native Americans. Hard telling. On that note, I’m in the much less ancient city of Joplin, MO for the night and today I passed up the chance to visit the Vacuum Museum and “America’s Sistine Chapel” created out of Precious Moments figurines. I can’t tell yet if I regret those decisions. Oh, but as my final final note, I’ve found a lot of these sites through a website called Roadside America. But as it happens, I found two things that weren’t on their list so I submitted them and now I’m a part of their website! You can read those pieces here and here. Let’s hope there’s something equally as interesting on route 66 to Dallas tomorrow. This entry was posted in Bikram, Bikram Yoga, Black Madonna Shrine, Mary shrines and sightings, Missouri, Road Trip 2011, Stonehenges, Stubby Stonehenge and tagged analemma, Bikram yoga, Black Madonna Shrine, Brother Bernardo still had a new yawk accent after 65 years in MO, Brother Bronislaus, I've been fascinated with the Black Madonna since reading a Secret Life of Bees, Our Lady of Czestochowa, Roadside America tips, Stubby Stonehenge. Bookmark the permalink. 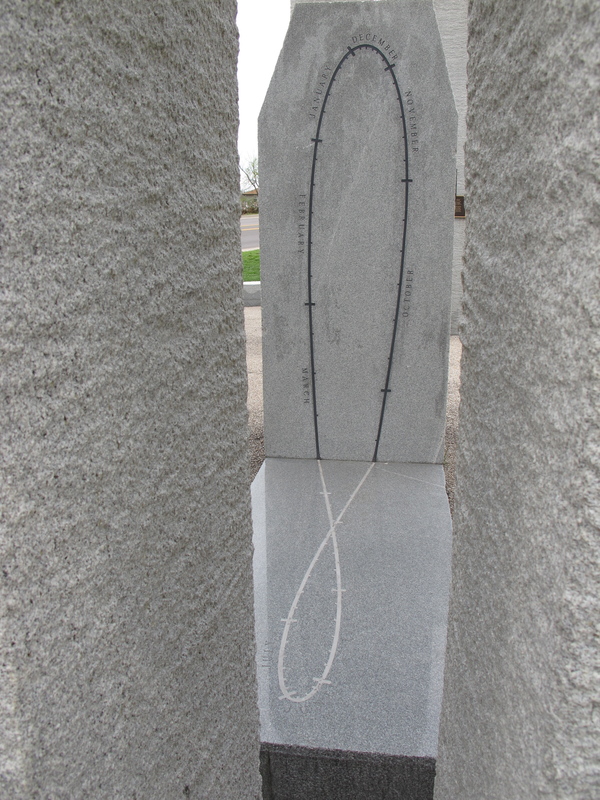 One never knows what will show up…We have a replica of Stonehinge (big as opposed to stubby) just south of us. You can make a pilgrimage when you get here. 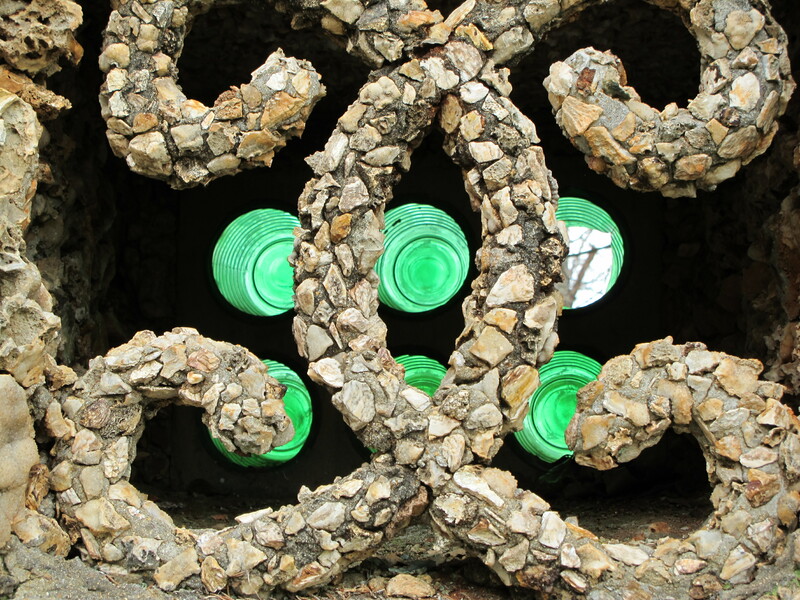 I know you don’t want to miss any stone hinges. fascinating! what an inspired and awe-inspiring place! i’m intrigued by the feminine spirituality also…so much to appreciate and connect with. how serendipitous to meet all those people. i like how you describe them. yes, yes, yes. This is one of my favorite places so far. I bought you a little Black Madonna charm! 9. We’re a group of volunteers and starting a new scheme in our community. Your site provided us with valuable information to work on. You have done a formidable job and our whole community will be thankful to you.